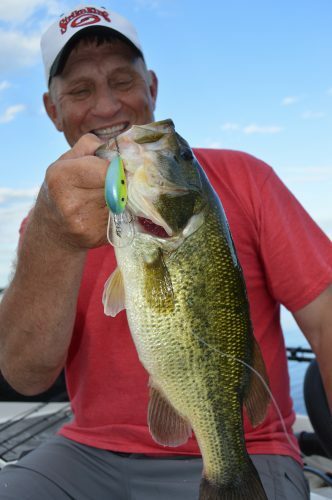 — Submitted photo Chad Peterson with a nice mid-summer weedline bass. We were out in the yard the other night at sunset. The cicadas were making the noise that they make, and that reminded me that summer has reached the halfway point, and that reminded me that, in the minds of some anglers, fishing isn’t very good at this time of year. However, fishing can be like the weather in mid and late summer: Hot! To take part in this potentially fast action, you’ll need to do things a little differently than you would at other times of the year. Following are some of those things. Generally, in the summer when the fish want to bite it works well to use faster moving baits and fish through areas quickly. If there are fish in the area and they see your bait, if they’re going to bite, they’ll let you know right away. However, if the bite is slow, you might be better off fishing slow and really working an area thoroughly. If you know the body of water well, concentrate on spots that you know hold fish and work them over. Let’s say we’re fishing for largemouth bass. Usually in the summer, early and late in the day are when the fish go on a good bite. This is when you’ll want to use a fast moving bait, maybe a buzz-bait, spinnerbait or crankbait. 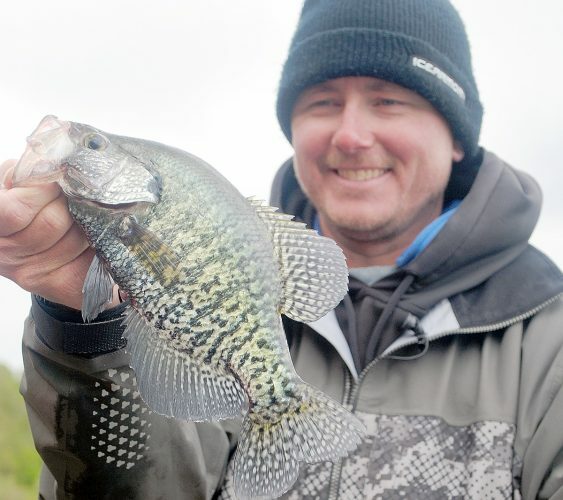 When the sun gets up higher and the bite slows down, you might want to go with plastics rigged on a jig or weedless. Fish it around vegetation, docks, or any other form of cover where bass hang out. Fish can be very selective when they get finicky. On a recent mid-summer fishing trip, we were throwing crankbaits along deep weedlines. It was an overcast day, so the bite remained pretty good throughout the day. Good that is, if we were using the right bait. My partner and I were both throwing crankbaits, trying different shapes, colors, and sizes. We went through a lot of baits, but a Strike King Series 4 crankbait was by far most productive. It was noticeable that this was the bait that the fish preferred by a large margin. The color wasn’t as important as the shape, but Powder Blue Back Chartreuse was a very good color on that day. It’s not unusual to catch a variety of fish along the cabbage weeds this time of year. The Series 4 crankbait is a shape that largemouth bass seem to prefer, but on this day, in addition to bass, we caught walleyes and northern pike, and although we tried more traditional shaped walleye crankbaits, it was clear that they liked the bass shape better. 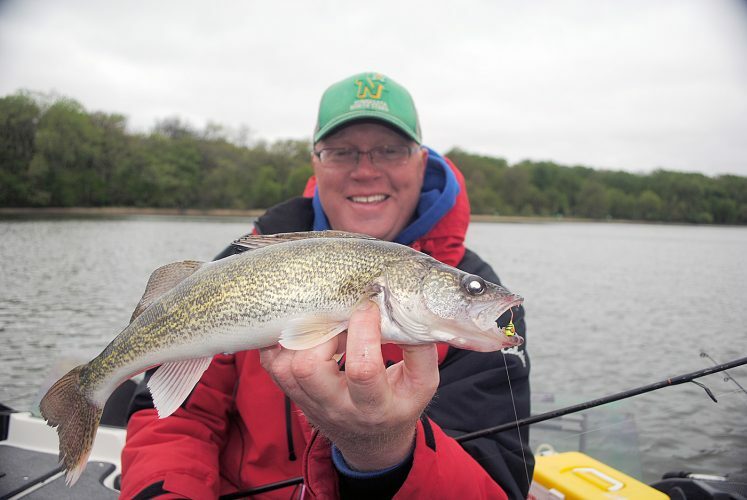 And this wasn’t a strange situation: In the summer, walleyes often prefer the shorter, fatter shaped baits that we usually consider a bass shape. Much of the time in the summer, the fish will prefer a faster moving bait, and also one that is moving erratically. Along the weedline, when you feel your bait hang up on a weed, give it a sharp rip. 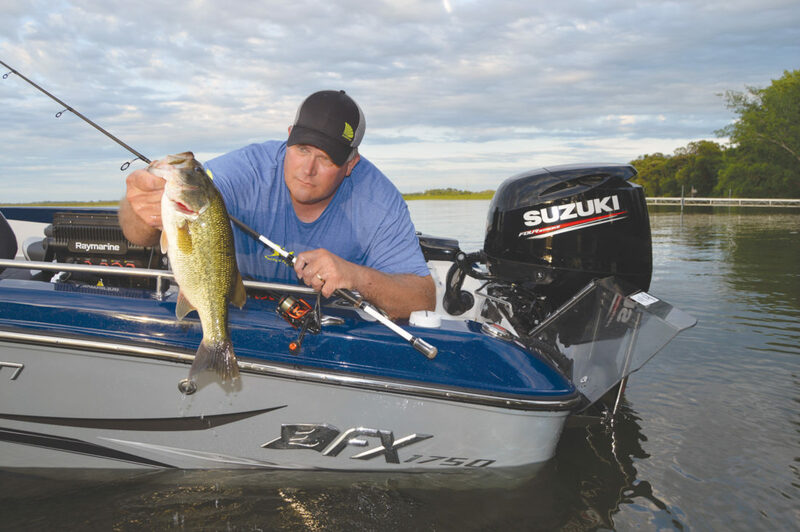 When a bass, walleye or pike sees that bait kind of struggling on a weed, then ripping free and appearing to be escaping, a strike will often be triggered. Fishing in mid-summer can be very rewarding. It’s fun to be on the water when the sun comes up, catch some fish, maybe take a late morning break and then be back on the water in early evening. You’ll catch fish, and you’ll be taking full advantage of all that summer has to offer in the way of fish.